The probe’s Solar Dynamics Observatory (SDO), NASA, found that giant dark spots on the Sun formed over the past 48 hours. It is likely that the new phenomenon causing solar storms. The storms are caused by these sunspots, regions where there is a decrease in temperature and pressure of the gaseous masses in the Sun, related to its magnetic field. The sun has cycles of activity of approximately 11 years, with the most intense periods. The peak of this cycle happens now, in 2013. The SDO spacecraft studies, since 2010, the phenomena occurring on the Sun, and somehow interfere with Earth. 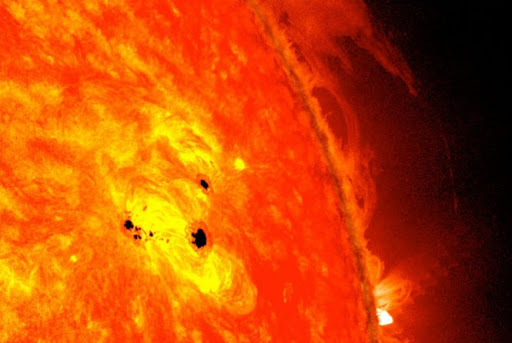 The image released by NASA’s SDO combines two instruments. One takes pictures in visible light. Have the other makes images with a wavelength that captures the lower atmosphere of the Sun. Together, the black spots have a diameter equivalent to more than six Earths. According to NASA, they quickly evolved into what is called “delta region.” This means that the lighter areas have magnetic fields pointing in the opposite direction from the center of the fields. Because it is considered an unstable configuration, it can cause eruptions on the sun radiation Depending on the intensity, the phenomenon can reach Earth in the form of solar storms. This can impair communication signals, but does not put humans in danger.